Internetworking Dynamics’ Microsoft certification training is held at the MicroTek San Francisco computer classroom rental facility which is located in the Financial District of Downtown close to the Embarcadero, Union Square and Moscone Center Convention area. Transportation to the facility is easy with the BART station on the corner and hotels within walking distance. The 12,800 square foot learning center offers 3 meeting rooms and 9 computer labs with internet access provided by T1 and DSL lines. Wireless internet is provided for the students' convenience along with high speed email workstations and phone stations. MicroTek has been providing high-tech computer labs since 1991. 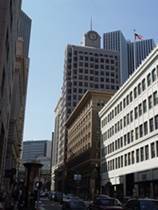 The building is at the corner of Market and New Montgomery, close to Union Square and Moscone Center. The facility is directly above the Montgomery BART station. Our building has a pink hue and it is directly across from the Palace Hotel. We are on the 3rd floor. Follow the signs for the Oakland Bay Bridge on Hwy. 80. Take the 4th Street exit, (last SF exit). Go straight on Bryant Street, (1 Block) until you get to 3rd Street. Turn left on 3rd Street and go straight, (4 blocks) until you get to The Hearst Parking Center. Take the Fremont Street exit, (first SF exit). Go straight on Fremont Street for 1 block until you reach Mission Street. Turn left onto Mission Street and go (4 blocks) until you get to 3rd Street. Turn right on 3rd Street and go (1 block) until you get to The Hearst Parking Center. Take 101 South to Lombard Street exit. Take Lombard Street to Van Ness Ave. Turn right on to Van Ness and go straight for 14 blocks until you reach Bush Street. Turn left on Bush Street and go straight for 12 blocks until you reach Montgomery Street. Turn right onto Montgomery Street. Montgomery Street turns into New Montgomery Street after 2 blocks. Turn right after passing The Sheraton Palace on Stevenson, The Hearst Parking Center will be on your right. The Hearst Parking Center is very convenient, located at 45 Third St. The entrance to the center is on Stevenson, which is the street right before Market. As you come up Third Street, the Center will be on your right, across from the ANA Hotel. New Montgomery is 1 block east, or right on Market. The following directions take you to the Parking Center. Flights should be booked into San Francisco International Airport. A car is not necessary, and we recommend using BART, a taxi, or the San Francisco Airporter to your hotel. You can get onto BART from the international terminal, it costs $4.95 one way, and departs every 15 - 20 minutes. Taxicabs are located outside baggage claim. The Airporter has 7 stops outside baggage claim departing every 20-30 minutes, with adult round trip fares at $14.00. Be sure to let the driver know your hotel. We recommend taking BART or MUNI if at all possible. Take the SF/Millbrae line to Montgomery Station. Exit through the Market & New Montgomery exit. This will bring you to the corner of Market & New Montgomery. Cross New Montgomery. MicroTek is in the Second building on the left.